Managers need to slow the bonus process, and there are too many bankers with senior titles, he said. Deutsche Bank AG co-Chief Executive Officer John Cryan, almost five months into his revamp of the firm, said bankers still earn too much money and are often promised rewards too quickly. Cryan, who took over as co-CEO of Germany’s biggest bank from Anshu Jain in July, elaborated on his philosophy for paying employees Monday — even taking aim at his own compensation package — just weeks after broadly warning that staff bonuses will have to reflect the cost of the firm’s fines for past misconduct. Managers need to slow the bonus process so employees aren’t rewarded for work before it comes to full fruition, he said. He also expressed concern that too many people have senior titles. The bank needs to “recalibrate” the way it pays staff to reflect the period they generate value, Cryan said Monday, noting that traders generate profits over a shorter period of time than the company’s corporate bankers or asset managers. Turning to titles, he said there are sometimes several layers of managing directors, diluting the importance of that rank. “There is some value to carrying a fancy card if you are a banker because it is true that you get a better quality meeting with a client if you sound grand,” he said. But for traders, it’s prowess that’s important. “The title is never used in the context of the day-to-day business,” he said. Deutsche Bank typically communicates and pays bonuses to staff in the first quarter of any given year. As part of a cost-cutting plan, the lender may shrink the bonus pool for its investment bank, the largest securities firm in Europe, by as much as 500 million euros ($531 million), or almost a third, people with knowledge of the matter said last month. The shares have dropped 3.3 percent this year. Cryan has joined a growing number of CEOs at European banks looking to shrink their securities units, which have been hurt by rising costs tied to past misconduct and tougher capital requirements in the wake of the financial crisis. Credit Suisse Group AG said in a share-sale prospectus released Monday that it’s reviewing its pay structure for 12 top executives after scrapping profitability targets. 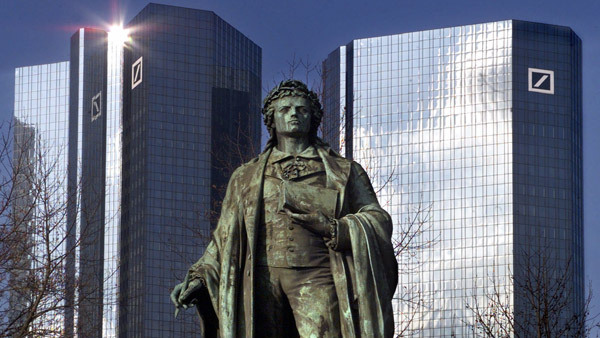 Deutsche Bank plans to eliminate its dividend for this year and next. In addition to pay, the firm said last month that it will cut about 9,000 jobs on a net basis by 2018 — almost 10 percent of staff it expects to have at the end of this year. Additional employees will leave as the company sells assets. The lender declined to comment on a report in The Sunday Times this week that it will shed 1,000 jobs in London next year. Among potential disposals in the U.K., the bank is considering selling its Abbey Life unit, which helps pension funds protect themselves against the risk of their members living longer than expected, people familiar with the discussions said last month. While Deutsche Bank cut pay when staff levels rose, it “is still too high,” Cryan said. Despite some progress, the firm has yet to strike the right balance in splitting profit between capital reserves, shareholder payouts and staff remuneration, he said. The bank hasn’t disclosed Cryan’s pay package. The company’s 24 percent stock drop last year prompted the firm to cut compensation for Jain and co-CEO Juergen Fitschen by 11 percent to 6.66 million euros for 2014. While the executives’ fixed salaries rose about 65 percent to 3.8 million euros, variable compensation dropped 45 percent to 2.9 million euros. Cryan said he’s skeptical that paying more necessarily motivates people.